The annual SMA Retreat in the Dromantine Retreat & Conference Centre concluded on Thursday, 1 July. Nearly 50 Irish SMA priests attended either the Directed or Preached Retreat which, overall, was held during a period of warm weather which allowed participants to enjoy the beauty of the Dromantine walks and grounds. Fr Frank Downes OP was Director for the 6 who opted for the Directed Retreat and Fr Con Murphy SMA preached to more than 40 others, including most of the SMA community in Dromantine. The following is a report on the Preached Retreat by one of the participants. 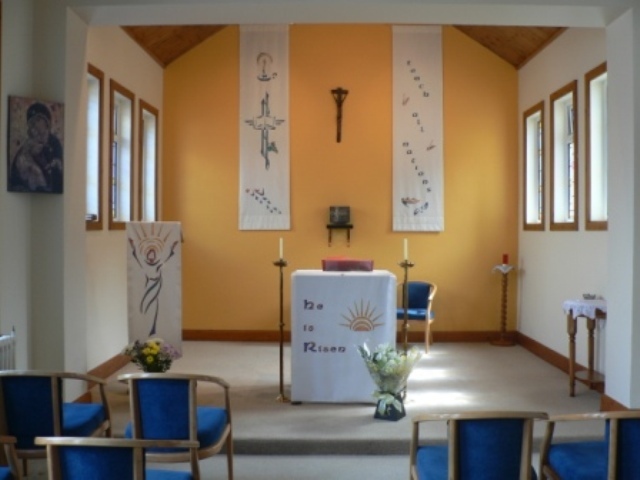 Pictured left is the recently-refurbished Small Oratory in St Brigid’s wing at Dromantine. Preached Retreat: The timetable for the Retreat allowed for two Conferences each day, morning and afternoon, as well as daily celebration of the Eucharist in the Oratory dedicated to St Patrick and St Thérèse. Each evening, at 8pm, there was an hour-long Silent Adoration of the Blessed Sacrament. Apart from meals the Retreatants maintained Silence and this fostered a sense of recollection throughout the period. In his opening remarks, Fr Con told us that his intention was to provide a framework for each of us to reflect on our life as a priest and how we have lived it. Quoting Blessed Henry Newman: “To live is to change and to be perfect is to have changed often.” Two aspects of that change: our vocational development and our relationship with God. Fr Con used many Scripture passages as aids for reflection and prayer. He also drew on Pastores Dabo Vobis (I will give you shepherds after my own heart), the document published in 1992 by Pope John Paul II after the Synod on Priestly Formation. Though already nearly 20 years old this document has many challenging insights which we should profitably reflect on and adopt in our own priestly lives. It addresses the human, spiritual, intellectual and pastoral aspects of the priestly life. 1 Corinthians 13, Galatians 5:22-23, Luke 18:18 – 30 and Genesis 20 were some of the Scripture pieces Fr Con invites us to reflect on in light of the above. Each day, at 12 noon, we gather for the central act of the Retreat, the Eucharist. Taking the themes from the different Feastdays celebrated during our days together, Fr Con explored the richness of the daily Readings, particularly the Feast of Saints Peter and Paul, preachers and defenders of the faith which we, as SMA missionaries, have the privilege to proclaim in Africa. But we also uncover the riches of our faith in the people we are called to serve. Expanding on that we were reminded that the priest is not at the service of the people who need his human resources but is at the service of Jesus Christ who has need of him to lead his people to a life of faith. And the central demand of a priestly life is pastoral charity. we are expected to be empathetic counsellors, to be understanding listeners and to listen respectfully. Fr Con also mentioned other expectations. Overall one could sum up by saying that the vocation to priesthood means a total rejection of the WIFM principle: What’s in it for me! Related to these he invited us to read and pray on the following Scripture passages: Hebrews 5 – 7, John 13: 1 – 17 and Luke 4:14 – 30. Fr Con also drew on insights from Fr Stephen Rosetti who has written extensively on the spirituality of priesthood and the need for ‘priestly wellness’. His book, The Joy of Priesthood, highlights the imperative of priests living celibate lives with integrity. Rosetti contends that, despite its challenges and struggles, there is great joy in being a Catholic priest. Psalms 63 and 56 were among the Scripture passages proposed to us for reflection at this point in the Retreat. The story of the disciples on the road to Emmaus also gave much food for thought throughout our days together. At the end of our Retreat with Fr Con that might well be our refrain too! Thank you Fr Con for helping us to hear God’s word and to gain some new insights into our vocation. As ever, we must say a most sincere Thank You to the lay and SMA staff in Dromantine who looked after us during our time there. The day after the Retreat ended we celebrated with Fathers Noel O’Leary and Eugene McLoughlin on the occasion of the Silver Jubilee of their Ordination as priests in the SMA.